POSMA Sport is an energetic brand with the mission of offering a wide range of quality outdoor wearable devices to the people who love sport. We hope to bring POSMA into customer's everyday life. The DB2 cycling computer features innovative GPS and Bluetooth 4.0 technology. This GPS - enabled bike computer tracks time, distance, speed, location and calories burned. The Bluetooth 4.0 let DB2 connected and having data transmission to iPhone/Android smartphone for training analysis. The DB2 cycling computer is ideal for training every day, touring rides and any advantage you want. 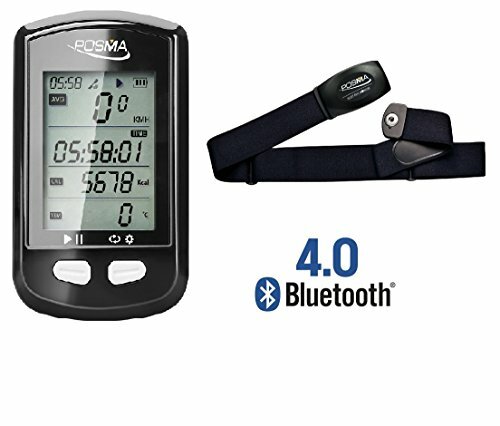 It is compatible with any ANT+ chest belt/speed & cadence sensors with standard ANT+ protocol. Display size: 30*38mm. Size: 75*48*20mm. Weight: 56g. Language: English.